Sure, we’ve all probably desired pin-straight locks so sleek they could give someone a paper cut. But how can you get the results you crave without imparting too much damage on your hair? We decided to weigh the pros and cons of blow-drying and flat-ironing – and see which method reigned supreme. Nothing gets your hair straighter than a straightening iron. A good iron will smooth the kinks out of any head of hair, leaving only sleek, gleaming locks behind. Plus, hair is more likely to stay straight throughout the day than when it’s treated with a blow-dryer, but at what cost? Many experts agree that flat irons are more damaging to hair than blow-dryers because they expose hair to more direct, intense heat. Think of it as dancing around the fire…versus jumping right in. Not the most sustainable practice, but dang does your hair look good when you’re through. The blow-out. All in all, the method that’s going to preserve your healthy hair is the method that’s going to keep you looking beautiful for longer (considering that no daily heat styling method is exactly great for your hair). Plus, it’s not necessarily the case that you can’t achieve pin-straight perfection using this means. 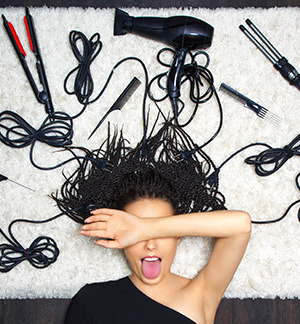 Keep practicing for that salon-quality appearance you desire, but please do try to give your hair a break now and then!